Gary Backstrom's Road to Utopia is doing a Todd TR-ibute/benefit in Boston to raise money for Alzheimer's patients, though The Alzheimer's Music Project. A portion of the proceeds will be used to provide them with free music players, loaded with music they love. This is often one of the few things they respond to. 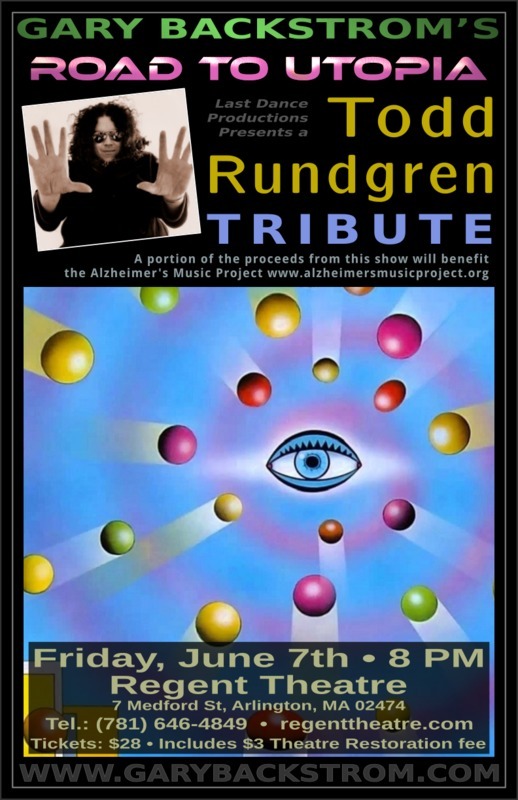 The date is Friday, June 7, 2019 at the Regent Theater, 7 Medford St., Arlington, MA. Tickets are $28 ($3 goes to the Theatre Restoration fee) and are available through Regent Theatre site. The 40 Years of Todd project has gone farther in 3 months than it took 10 months to accomplish during the last campaign. If you have already contributed, THANK YOU! In case anyone needs a reminder, every contributor of $5 or more will have their name listed in Rolling Stone Magazine's November special 40th Anniversary Issue. So far, 167 fans have given over $2500 toward this tribute to Todd. The hard truth is it will take 10 times that number to reach the goal of a full page ad. And in June the contribution flow tapered off drastically. In order to give things a boost, I am making the following offer. For every donation of $25 or more received by June 30, 2007, I will ship not one, but two commemorative shirts. The first batch just arrived and I am quite thrilled with the way they turned out. I know it's only been a few short years since we pooled our efforts to celebrate 30 Years of Todd (the album). But since I discovered 2007 is the 40th anniversary of Rolling Stone Magazine AND the 40th anniversary of the birth of NAZZ, I am compelled to mark the occasion. As you no doubt recall, last time out we gathered enough fans and enough money to run a quarter page full-color ad in issue #965 of Rolling Stone. It would not have been possible without the support of each and every participant. So I will take this opportunity to say thanks once again for that great success. This time, I believe it is possible to generate enough interest and enthusiasm to run a full page ad for 40 YEARS OF TODD. As before, a prize table will be set up for different donations amounts. And some great offers are being finalized as I write to you. However, a full page ad is a big goal, and funds are needed throughout the whole campaign to get to the finish line by the reserve date of October 12. That is the latest date to assure inclusion in the November special issue which will focus on the innovators in Rock history. In my book, that's a perfect fit for TR. October is a long way off. However, it is a mistake to wait until then to opt in. It takes a bit of advertising and promotion to make this all happen. There are things to do right now to help this come about. First and foremost, Todd is on tour now. This means thousands of fans who might not hear about this project are congregated at venues across the country. The immediate need is for printing announcement post cards to send to all fans who are willing to get them to show locations. I have already produced an on-line PDF for any highly motivated fans to download, print, cut, and distribute. But it is more cost efficient and easier on everyone if I use some of the early proceeds to get a big run of cards made. I guess I buried the lead, but the big news is at the start of this round in order to get the most fans involved as I can, I am only asking for a $5 donation to qualify for getting name listing in the ad. I am hoping the idea of doing this again with the goal of a full page ad is something you want to support and support early on. Please visit www.toddata.com for all the details, and don't wait to send your contribution to TODD40@toddata.com via www.paypal.com. You may also mail check or money order to the address below. And also please consider printing and distributing post cards if you are going to see the Power TRio or the New Cars. As cliché as it sounds, this can't happen without the fans behind the idea. Toddata and 40 Years of Todd have no official affiliation with Todd Rundgren or Rolling Stone Magazine. Rick is a drummer trying to get a Todd tribute band together in NYC. Interested? Contact him at melara@un.org. Over the last few years, a number of Tributes to Todd have been produced. The most recent is from the awizard mailing list and is called "Don't Quit Your Day Job". Several of the songs can be downloaded online at http://www.geocities.com/SouthBeach/Lagoon/4029/tribute.html. They've already begun collaborating on generating a fan version of A Wizard, A True Star! A Japanese Tribute album (Japanese artists covering TR material) was released in 1997 on Pony Canyon. Todd mixed 6 of the songs. The artwork is by Bill Bricker. The Granddaddy of them all was "For The Love of Todd" also compiled by Mitch Cooper.